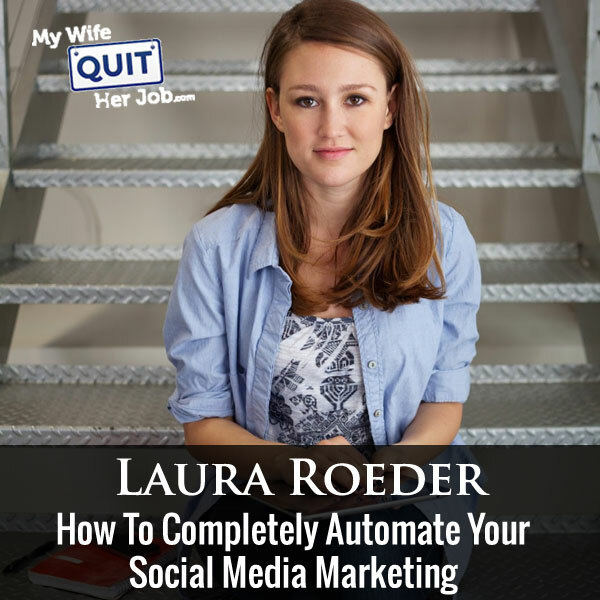 Laura Roeder is back on the show to teach us how to completely automate your social media and how to create a SAAS business in the process! If you don’t remember Laura, she was on the podcast back in episode 9 where she taught us the right way to handle social media. Since then, she’s launched an amazing tool called MeetEdgar.com which is what I now use to manage both my Facebook and Twitter accounts. Stay tuned to hear how Laura created an incredibly helpful and successful Saas Tool. Enjoy! Intro: You are listening to the My Wife Quit her Job Podcast, where I bring in successful bootstrapped business owners to teach us what strategies are working and what strategies are not. Now this isn’t one of those podcast where we bring on famous entrepreneurs simply to celebrate their success. Instead I have them take us back to the very beginning and delve deeply into the exact strategies they used early on to gain traction for their businesses. Now if you enjoy this podcast please leave me a review on iTunes and enter my podcast contest where I’m giving away free one on one business consults every single month. For more information go to www.mywifequitherjob.com/contest. And if you are interested in starting your own online business, be sure to sign up for my free six day mini course, where I show you how my wife and I managed to make over 100k in profit in our first year of business. Go to www.mywifequitherjob.com for more information, now on to the show. Steve: Welcome to the My Wife Quit Her Job podcast, today I‘m really happy to have Laura Roeder back on the show, now quick intro in case you don’t remember her, Laura runs LKR social media where she teaches others how to expand their social media presence, and if you don’t remember her I had Laura actually on the podcast way back in Episode 9, and a lot has actually happened since then. So first off she gave birth to a very cute baby boy, she hasn’t been sleeping for more than three hours a night, she no longer stays out past 8:00 pm ever, but besides that she started a super cool SaaS company called Meet Edgar which is software designed to automate your social media presence. Now incidentally I have been using Meet Edgar for about a year now, and my facebook following has doubled since then, and even though I don’t have a new born like Laura I’m actually getting sleep, with two kids and multiple businesses I have very limited time for social media. And with Meet Edgar I pretty much do nothing, and my social media accounts just continue to go up and to the right. So the tool truly works and today Laura is going to tell us how she came up with the idea, and then nuts and bolts behind creating your own SaaS business, and with that welcome back to the show Laura, how are you doing today? Laura: Thank you, I’m doing great, I’m really happy to hear those social media results, you’re actually one of our early users of Edgar. Steve: Oh yeah, is that’s right. Yeah I remember on your– giving you feedback about it, and I liked kind of how you rolled it out and so I was hoping to get into that a little bit today. Steve: But quick, real quick, give us the quick background story regarding Meet Edgar because I didn’t really give a very thorough intro on what the tool actually does. Laura: Yeah, so when I was running my social media training business, LKR social media, we were teaching a methodology about creating this giant spreadsheet with different categories in it, and that’s your social media updates and write a bunch of updates in one category, put them in the spreadsheet, then copy and paste them from the spreadsheet to you social media scheduling tool of choice. So this is the process we were using, this is the process we were teaching, all of our customers were using and whenever you have a giant spreadsheet of social media updates, as you can imagine it gets pretty cumbersome. So what I really wanted in a tool is one, I just wanted a tool that sort of a library of my updates. To this day it bubbles my mind that more tools don’t have this, you send now your social update near your tool, but most of the tools don’t save them, maybe there’s some sort of stats section where you can see the stats, but they don’t have an organized library of all your updates. So I wanted my library right in the tool and I wanted to repeat my updates automatically, that’s the way we are teaching people how to do it, you go through your spreadsheet, go through everything in your category and once you are done, just go back to the top and start again. So I decided that since it wasn’t out there already, someone had to make it, and that someone would apparently be me basically. So our company built Meet Edgar into 2014, it’s grown amazingly since then and we finally have the social media tool that we wanted to use. Steve: Yeah, so I remember back in the day before Meet Edgar, I was actually using a couple of other tools that allow you to schedule your tweets and your Facebook posts in advance, and I just could never keep those queues full because it tool my time and energy to do it. Steve: Yeah, so real quick for people who don’t know what is actually the business model behind Meet Edgar and how does it generate money? Laura: So it’s your typical SaaS business, most of our customer are paying $49 a month, that’s kind of our basic small business plan, we don’t have a free plan since we are a business tool, a lot of social media tools kind of toe the line between having consumer usage and having business usage. We’re really focused on the small business, or the monetized blog kind of whatever your business looks like, and that’s how we make our money. Steve: Yeah, so really quick, I was kind of curious about that because a lot of these guys have freemium plans, so what was kind of your decision making process behind not having that and just charging $50 a month right off the back? Laura: It’s definitely something that we’ve thought a lot about and gone back and forth on it, and I’m not saying that we would never do it; I think freemium can be a great marketing tool, but the problem with freemium is that you have to support a lot of free users, that’s part of the deal. And we haven’t raised money we’re a bootstrap tool, so if you don’t have millions of dollars in the bank that you can use to support customers that may not ever give me money, it can be really challenging to do freemium,. So we just really don’t feel like we had the bandwidth to do all the back and stuff and support for free customers and be able to make money, and the other reason was we really wanted to be really clear in positioning like I said as a business tool. A tool like buffer is great for business; it’s also great for just people who are using social media just for fun, just for finding stuff, put on your personal twitter account. We really wanted to let people know we’re not a good tool to use just for fun, because we are a bit more advanced, you have to fill up your library, you have really think through your contents. It’s kind of a different work flow, than a lot of people use right out of the gate [ph] on social media. So I thought that will definitely make it really clear if we’re charging at least $50 a month, that you really are using this as a tool to market your business. Steve: Okay, and so you mentioned that you’re a bootstrapped company, how does one actually go about studying Meet Edgar SaaS based business with recurring billing, are you guys using any standard platforms, or is it just kind of coded from scratch? Laura: No we use a lot of different tools, so for billing we use Stripe for all of our recurring billing. Steve: But in terms of the side structure itself, like the Meet Edgar website, and then all the back end stuff, is it like standard platform or did you guys hand write a lot of stuff? Laura: We use both, I’m not like– I’m not a—that is somewhat of a CDO [ph] question. Laura: Like I know we use [inaudible] [0:07:27], I don’t know what [inaudible] [0:07:28] sort of is. Steve: Okay, no that’s okay. Yeah, so and I remember when I first started using your tool, I remember that you kind of had this very deliberate launch sequence. You started out with something very simple kind of bare bones, and then you had people like me kind of test the heck out of it. And so can you just kind of talk about your approach to releasing your SaaS based software and kind of the process that you went through. Laura: Yeah, so we wanted to, like most SaaS businesses release as early as possible, without being too early, which is always a difficult balance to strike. So we started coding in January of 2014, probably about a month or two after that we put up just a really super basic landing page, basically saying something like Edgar is going to manage your social media, and just letting people know the very basics that it was a social media tool, and letting people put in their email address. So we started collecting emails of people who are interested. A few months after coding– obviously we started using it ourselves and testing it ourselves as early as possible, and then reached out to a few friends, so you may– I don’t know if you actually started then, but you might have been one of those early friends that I reached out to because you have such a huge backlog of content, which is one of our best used cases for Edgar, people who have spent years generating content like you have. So we reached out to friends, offered them accounts to play around with it and use, maybe about like 10 people, we did that with. And then we opened it kind of quietly, we didn’t do a huge whiz bang launch, we had an existing list from LKR business, which obviously was a massive help in launching Edgar, and we leveraged that list by kind of trying out different marketing sequences for different segments in the list, trying out different messaging and things like that. So we did have– I remember we had a Google hang out that we positioned as kind of a launch party that we’ve been in I think July or August of 2014, but by the time we had done that we had already reached out to different segment space, that we were just sending marketing emails saying, hey this is something you might be interested in signing up for. Steve: So that initial group it was just ten people, I remember I started it back in June 2nd of last year, was I among the first bunch, or how many people do you have in that first squad? Laura: I think you were kind of like the 2nd probably then sort of the 2nd squad. Laura: Yeah, because I remember emailing you, you’re like this looks cool but it’s going to get too much time to set up. I was like no we set it up for you, now don’t worry about that. I had to convince you a little bit, which you know it was very typical actually that’s kind of our biggest challenge in Edgar is it does take more set up on the front end, it actually saves you—I mean your users thousands of hours of time, but it can be difficult to convince people to put in time in the beginning. So yeah I think we had a few people at first, and then I kind of kept reaching out to more friends, getting more people on it and getting more feedback. Steve: Yeah, it’s funny I remember I asked for a couple of features early on, but of course you were still just trying to get something out there and get feedback, and then since then you’ve added a bunch of stuff. We’ll get into all of that in a little bit, but I wanted to ask actually because I was a little bit curious about starting my own SaaS business at some point, how much upfront investment did it actually take to just get started? Laura: So we put in a lot of money for advertising, so you won’t have to put in that much money, so it’s really a little misleading to say that we’re bootstrapped. I would say self-funded would be a more accurate way to put it, because we definitely had a period of time where the tool was not paying for itself. We used money from the LKR business to start the Edgar business, so we’ve put, I would– I actually don’t even know the exact number. I would say maybe like about 200,000 or 250,000 into Edgar, but a lot of it is Facebook ads, you could do it for less if you just needed to pay development costs. Steve: Yeah, I was just talking about just getting the tool out, not necessarily the advertising, like for example you need someone who is a tech, right? Laura: Right, but you know a lot of people do that with the cofounder relationship, which can be a really great way to do it. So if you’re a marketing person like me, who’s not a developer, finding a technical cofounder is a great way to go. I would say that’s a much great to go by the way than hiring some kind of outsourced stuff [ph] shop, which is how a lot of people do it and is I think most people will tell you almost universally about idea, you need to have people that are more core to your team, building your product. Steve: So do you recommend marrying your tech cofounder? Laura: Yes. Well there is no work for free which is awesome, you know you are married and you work together and none has a [inaudible] [0:12:19], you work with your wife; it’s a whole lot of situation you’re at. Steve: So people who are listening here, Laura started this business with her husband, and her husband is the tech lead on the entire project. And so every now and then she throws in a couple of pizzas in his office and ask for new features. Steve: So just curious, so when you started out was it just you and Chris or? Laura: No, because we were able to leverage the team from LKR as well, so he built the initial product by himself, by as far as even like determining the road map, we had feedback from the rest of the team; marketing support from the rest of the team, the team has always run both businesses. Steve: Yeah, so in the beginning then, what would you say was like a bare bones team that you would need to launch such a product? Laura: You need a developer and a marketer, and by the way a lot of people skip the marketing side of things. A lot of people are developers and they build a product and they put it out there and they think that if keep adding more features, then they’ll get more users, and not really thinking how people are going to find out about all these features that we are building. Some people have both skills like Nathan Barry is this really rare brand, he’s like a designer, and a developer and a marketer; he’s just like this amazingly talented human being. If you’re not him which I’m not, I think the two main sides are development and marketing, that doesn’t mean you need a fulltime role for each of those, it can be a project that you are building on the side, for sure but you need to build a good product and you need to let people know about it. Steve: Yeah, Nathan Barry, he does convert [inaudible] [0:14:03] right, I think he reached out to me in the past. Okay so I didn’t realize that he does everything himself, and it was just pretty much you and your husband in the beginning, and then you had your LKR team handle a lot of the stuff as well. Laura: Yeah, like customer service, I didn’t have to do that myself because we already had a customer service team, but that was a leg up that I had, and you can defiantly do things like customer service with a two person team. Steve: So you have the– your husband who’s creating the product and then you have your cell phone marketing and then you have a customer service team, so how did you actually– you mentioned that you leveraged your list to get the word out about the tool, but after you’ve kind of exhausted your list, how else did you reach out to new users? Laura: So Facebook ads have been huge for us, we also do social media marketing, content marketing, but we’ve gotten a lot of users through Facebook ads and you know that’s another reason that not being freemium has been really valuable for us. We get to collect $49 if not immediately, then sometimes with our different promotions, the two week trial or something like that. Within a month we are collecting $49 for someone, from a customer. So that gives us a really big lee way with how much we can spend per lead on Facebook ads. Steve: Could we talk about your Facebook ad campaigns for a little bit. And so when you run an ad, do you run them to just one of your sign up pages for a free trial, or how does it work? Laura: We definitely experimented with different things; we usually are just running people to our Edgar home page. But that is a direct call to action, it depends on the sequence we’re experimenting with, yeah sometimes a free trial, sometimes requesting an invitation, which is the flow that we’ve used a lot really successfully and like requesting invitation, and then you get the invitation for your spot on Edgar in an email a few days later usually. So we’ve experimented with different things. Laura: Yeah, we do follow up marketing via email, calls to action, obviously depending on, are we asking you just to use the tool in the first place, have you signed up for the tool, and we are getting you to activate it to actually use it? Have you already paid us, and do we want to make sure that you are actually getting your content in there, [see you??] or cancel. We’ve built on email sequences for all these different scenarios. Steve: Okay, but in terms of just getting them to sign up, has the best method been just to drive Facebook people directly to your home page or sign up page? Laura: Yeah, actually it has, we don’t do, check out this e-course first, or anything like that. The main sort of [inaudible] [00:16:50] we’ve used on ads is just this is a new social media tool for you to check out. It sounds really basic, but a lot of people are interested in social media tools, and there are going to be a good lead, if they are clicking on something that just says, this is a social media tool, take a look. They are obviously very interested in the product. Steve: Okay, and you don’t have to tell me this, but I’m very curious. How much do you pay per just lead when you are using Facebook ads. Laura: I know we always keep it under like $10 to $15 a lead. Steve: Oh, okay, and then how many of those leads eventually sign up for something? What I’m trying to ask is, is it– like how do you determine the profitability of the ad? Do you just take into account like the long term value of that customer, or do you do it based on just getting them to sign up, if that makes sense for you? Steve: Yeah, so there’s also different ways to look at it, looking it the long term value, SaaS to pull LTV lifetime value. That actually, I think that’s something interesting to talk about, because I think that can be a whole trap– I don’t know, you know what I’m trying to say that a lot of startups fall into. Lifetime value means that it’s going to take a long time to collect that money. So right now, our LTV last time it was around $900, which is great. We cost about 50 bucks a month, but it’s going to take us a long time before a customer gets this $900. And I think a lot of people make the mistake of basing everything like their ads of LTV, and not looking at okay, do we the cash run way to get us to $900. Because you hear people say, oh, we’re going to make $900 customers, so we can spend $500 for the Facebook ad that gets us a customer. Well, that’s not really true, because you have to pay the 500 now. You get the 900 over a few years, so I like looking at things like one month value, three months value, six month value per lead. And then you are actually comparing money coming in and then time frame where you can afford the money going out. Laura: So in terms of your Facebook ads, and how do you determine whether the campaign has been a success. Do you compare the three month, the six month, or which time metric do you use? Laura: I mean we would like to use one month, like I said because we are collecting good amount of money pretty quickly. And it is possible for us on Facebook to break even within a month, so that’s what I look at. Steve: So what’s really cool about your tool is once you are in and you spent all this time getting your content on there, you are not going to leave. Like you got me pregnant so — I can’t leave. And so I guess that’s one of the advantages of your tool. Laura: It’s a very sticky tool right, because you load your whole library of social media content and — so we’ve got you there. And also it’s just really genuinely useful once people start using it like you said; it just does your social media for you. So it’s really hard to get rid of that once you have it up and running. Steve: Yeah, and so — which kind of brings me to kind of my next topic. I was just wondering how your on boarding sequence now, and how that works to get people actually invest the amount of time to actually get started with it. And kind of get them pregnant so to speak. Laura: Yes, so we found that the more done for you ready to go we can make the tool, the more people will use it. So the challenge with Edgar is that you have to build a small library before you can use the tool. So a lot of people are used to the workflow of doing their social media, one update at a time, think of something to say, send it out. Maybe you are using a tool like Buffer that makes it a little more leverage to sending it out of a time. With Edgar we really ask you to think differently where you have categories, where your social media updates are at being batched in the categories. So in Edgar, you are going to go through your blog and look through the last 15 posts, and load those updates in Edgar. You are going to come up with 15 inspirational quotes and load them in Edgar. So it’s a bit of a different mindset for people, and one big change we made that really-really helped us get people using the tool is just simply loading a default schedule. We used to ask you to come up with your schedule yourself of when you are going to send your different categories to different networks. Now we’ve just looked at the data, what are good, just generally performing time slots. And we’ve got that up as a default, the vast majority of our users at least start with that default. And a lot of them just use it forever because it works fine, you don’t really need to make it any more complicated. So something we are working on now, we have our access input, but it’s pretty buried within the tool. And we are going to make our access input one of the first few steps when you first sign on to the tool. It wasn’t like this when you signed up; we’ve improved a lot, so you probably haven’t seen it. We have kind of step 1, step 2, step 3, and one of the steps will be just copy and paste your blog URL, and then Edgar can automatically go through, pull up all of your blog content into the tool. Now you have priceless content for you ready to go, ready to send out in Edgar. Steve: That would have saved me a tremendous amount of time. Laura: Sorry, but now we have it. Steve: Yeah, great, so what’s funny is I was thinking about this just now. Like the easier you make it for someone to get onboard, do you actually have a tool for them to take their library with them as well? And I was just kind of curious like what are some of the things you do to reduce [inaudible] [00:22:27], because the easier you make it for them to migrate, the easier it is for them to leave as well right? Laura: Yeah, it can be, I mean it’s a little weird because it’s not like there’s a standard across social tools. We do allow you to import and upload a spreadsheet of your social media updates, but there’s no standard. You are going to have to monkey without spreadsheet, taking it out to another tool. And there’s just little and just to go things like Facebook preview, we can’t do that if you have uploaded it from a CSV. You are going have to — so like unfortunately uploading a book of updates, a good amount of our users do it, but it’s not — the social media platforms don’t allow it to be as seamless as I would like. So that’s actually not the primary way that people get the content into Edgar. Steve: Okay, and so how — do they just do it manually then right now? Laura: They do it manually yeah, things like the chrome browser plug-in makes it much easier. Then you can just like open up a bunch of content, you just kind of hit the button over and over again, get it loaded up in Edgar or things like, if you are doing inspirational quotes, like this is where the batching comes in handy. If you are doing quotes, open up a quotes library, do 25 of them at the same time, just copying and pasting into Edgar. Batching by category makes them much faster to get content into the tool. Steve: So I haven’t actually gone through and signed up for your tool as a real user so to speak. And so can you kind of just go through, like your typical on boarding sequence to get people into the tool? So let’s say I just sign up right now, what’s the first thing that you have me do? Laura: Yeah, I’m actually opening the App, so I can tell you exactly how we do it. I wish I had like our actual sequencing. Steve: And you don’t have to give me specifics, but I’m just trying to get out of you, what are some of the challenges in getting people addicted to the tool? And where are some of the hot spots and how did you point those out and get over those? Laura: Yeah, so we’ve looked at a lot of data, because matrix is really cool for looking at data of what people are actually doing, within your App. So for us the first thing that we ask people to do is to connect to their social media accounts. Twitter, Facebook, LinkedIn, that stuff has a huge adoption rate, almost everyone who signs up for Edgar, and ever bothers to open the tool at all, connects their social accounts. It’s just so really easy stuff. The next step is getting content in and that’s the hardest step. So something that really helped adoption there is having prefilled categories, I have mentioned categories several times. We don’t make you come up with your own when you open up the app; we have content from your blog, content from other people’s blogs, words of wisdom, quotes. And so that makes it much easier for people to sort of wrap their heads around. Okay, this is what I do with social media, and I think that’s one of the reasons that Edgar has been so popular. We are very different from other tools because we don’t just send out your social media; we actually help you craft your social strategy, with this category based thinking. Another category is promotions, a lot of people don’t really seem to strategize okay, how many promotions do I want to send out, as opposed to links to my blog, as opposed to links to other people’s blogs. Edgar helps you do all that automatically, so that really helps people fill in the blanks. And then I mentioned then you go to your schedule page, get everything set up, and we have the default schedule with all your categories already filled in on a time slot to make that super easy for you. Steve: Okay, yeah, actually all that stuff was actually available when I joined as well. And I remember using your default categories for all of those things as well. So I have actually used a lot of different Saas Apps, and there’s some where I’m too lazy to set up. And I go through like one step and then I forget about it, and then a couple days later lo and behold I get a very specific email, telling me, hey I noticed that you did this step, you didn’t do that’s step, why don’t you just click here and do that step now. Are you guys using — first of all, do you guys do anything similar, and what are the tools that you use to do that? Laura: Yeah, we use intercom to do that which is really amazing tool, and both does in and out messaging and sends emails. And we are always looking for ways to build out intercom for those specific little nudges that people need. Steve: Okay and so do you send out those nudges for people that add content as well as connect social media accounts and that sort of thing? Laura: Exactly, wherever we see in the App that they haven’t done, will send them a reminder. Steve: Okay, intercom.io, okay, that’s a good one to look up. And in terms of — when I asked on how you actually got the word out about Meet Edgar, you mentioned Facebook Apps. But are you guys doing anything else and why is it just — why is advertising your app just kind of blend to the Facebook platform? Laura: So what’s really cool about Facebook is that, there are so many amazing targeting options. And the one that we primarily use is targeting based on other pages that a user likes. So we base it on other small business tools. So we obviously do competitors like Hootsuite, Buffer, Sprout Social. We also do tools like MailChimp and Constant Contact, and Aweber that allows you to get really horned in, because you are not really going to like Constant Contact’s page, unless you are using their software, or at least you are potentially using their software, it’s not something that you really like just for fun. Steve: Right, yeah, exactly yes. Laura: It’s pretty specific, so it allows us to make sure that the user one is some sort of small business marketing person in that category. And two and that they are interested in paying for tools to market their business. So it’s just a really obvious match. And we also do a good amount of content marketing via blogging and leveraging guest posts, appearing on podcast like this one. All contribute to our marketing, that stuff is a little more slow burn, it kind of adds up over time. I would recommend that any business start blogging from day one, you are not going to bring in a huge amount of traffic immediately, but after a year of blogging, you are going to get your search traffic to a great place. Another thing we’ve done that’s been really-really effective is asking users to review us on their blog. It creates a lot of really good quality back links, which I think has helped us rank in the search engines. And it’s really genuine; we actually don’t have an affiliate program. So all of anything you read about Edgar online, you know that it’s true, which is something we did very deliberately. I was frustrated as a user looking up reviews for things and only finding affiliate reviews, that didn’t really give me an honest answer. So we are able to link to these reviews and our marketing materials and say you know that this person is telling you exactly what they think of the tool. Steve: Interesting, so you didn’t actually tell me to write a review, but I ended up writing one anyways last year. Have you been reaching out for those or have just been people just doing them on their own volition? Laura: It’s both, people write them and we reach out. We tell people; hey we’ll give you a little exposure by linking to this in our emails, and on our social accounts. So that gives them an incentive, but we find that people love talking about tools, like small businesses are very interested in tools that other businesses use. I know I’m, I love hearing about the tools that are running a business behind the scenes. So it seems to be sort of just a natural topic that people like to blog about. Steve: Yeah totally. And in terms of your blogging efforts have they kind of added value? It’s been a year now, right? – At least since I have been using it – has the blogging kicked in? Laura: Yeah well I guess now it’s tuning up, just a year now. So we’ve been blogging for Edgar I guess for about six months now. And for us it’s definitely been more of a slow branch channel. I can’t say that we’ve had this huge hit that went viral all over the internet and brought us a ton of leads. But blogging I just think it’s important to give people something to share, to link back to your site. Steve: Okay, right. And I’m just curious, I’m sure you have a bunch of success stories by now. Have you guys kind of been gathering those together and I don’t know going out and using those in your ads and your other outreach as well, like I’d be happy to do that for you guys too. I was just wondering– you know, just wondering if you’ve been soliciting those? Laura: Yeah, we get a lot and naturally if you go to www.meetedgar.com/reviews we have a ton of them linked. We actually have way too many and they are not organized. There’s a lot of improvements we can make on this page. But we have email sequences asking people for feedback and people do send– just keep on sending and a lot of great reviews. Steve: Do you incentivize them in any way or is it just based on an email and you ask them to do it. Laura: We don’t. You know, we’ve really avoided doing specific incentives for like go to review or for writing a blog post or something like that. I think it’s just sort of better if it feels like a natural friendly win-win relationship. Steve: Sure, okay. And in terms of other like, pay per click advertising, like are you using adwords or anything with Pinterest or Instagram, that sort of thing? Laura: No we are hiring someone now for a fulltime online advertising role. And they will be responsible for expanding into those other networks. We just have the bandwidth on our TM to be honest, but that’s definitely the future for us. Steve: Okay. And you know for some of those people who like myself actually who are thinking about starting their own SaaS business, like what are some of the tips? Let’s say you are me, how much money should I have? How should I start? What’s the best early way to get the word out and that sort of thing? What would you advice? I know it’s a really broad question. Laura: So above any of that stuff, the most important thing is just honing in on your MVPA, so that you are launching with a really strong and focused idea. I think that’s what– well most SaaS businesses, I mean, most of them never get off the ground. The vast majority do not even make it to the live stage because they get caught up in development. The classic thing is just feature-create, adding more and more features, getting more and more disjointed, which in turn makes the marketing more and more complicated. You know trying to convey what this tool does. Or people will launch something that they are really not sure if there’s a need in the market for. Maybe, I think another common problem with SaaS, there’s a lot of great ideas that no one is going to pay for. You see this with apps a lot. I was at the airport the other day and I thought, “I wish I had an app that told me the best terminal to sit in with like the comfiest chairs at this airport.” I think it’s a great idea for an app. I would never pay for it and I don’t think anyone else would either. But I would like to have it. And you know a lot of people are like “Oh this is cool. I wish I knew a comfy place to sit at the airport. I’m going to build this app or I’m going to build this SaaS,” without really thinking through or testing, is there a market that will actually pay money for this. So you know before getting the word out, the most important thing having this really drawn down specific idea for the problem that you are solving with your software. Steve: Let me ask you this. I know you guys released Meet Edgar with a pretty bare bones features set, how did you kind of balance the release of features versus like the-must-have versus the nice-to-have? Laura: I think that’s the hardest thing. And that’s what my husband Chris really taught me a lot about. You have to release with a lot less than you probably think that you can. In my experience that’s kind of– your expertise is in ecommerce and I would imagine ecommerce is similar where you should launch with a more specific focus for what you are selling and then expand from there. Is that accurate? Steve: Oh yeah absolutely, because you know, you only have a certain amount of capital in the beginning. And you should just release with a product set that you can comfortably feel– that you feel comfortable with, and then just test the market early on and just kind of make adjustments, because a lot of the things aren’t going to sell, and some things are just going to sell like hot cakes. I guess it’s similar to your SaaS business. Laura: I think it’s actually a really good analogy where some features are going to sell like hot cakes and some features no one is really interested in. Steve: So can you give me an example of like a feature that you did not have in the beginning that everyone was asking for versus a feature that you put in where no one was actually interested in all of it. Laura: Yeah. So I have some great examples of that actually. So one of the big arguments that my husband and I had when we were launching was whether we needed our own in-house analytics? Because I thought this is all about repeating the most successful updates. We have to show people the analytics, and he was just like it’s not our core thing. We do have them now and most of our users never even look at that part of the site. It’s really, really neglected. And that’s– it’s so great that we launched later with that. And we launched with a more bare bones, because we could have spent a year building up this amazing analytics far beyond what any of the other tools have. It turns out that’s not the most important feature to people. And that’s an interesting one because actually a lot of people think that’s important, so they’ll ask you about it, like when I tell people about Edgar, that often comes up. They’ll ask me about the analytics. But when they are actually using it, I think people just don’t really have time to even look. Laura: Right, I obviously should have listened to you because yes, the import has been a much more used feature. Also the spreadsheet info, I mentioned most of our users are importing this spreadsheet, but a lot more are than I suspected. I thought we were going to add that and no one was going to use it. But people do use the spreadsheet import because a certain amount of our users have just been organizing their social on spreadsheets on their own anyway. So they kind of already have some sort of spreadsheet they can tweak and then put it on Edgar. Steve: Yeah and totally and actually you could probably do the Facebook snippets also right, by having a separate field on spreadsheet upload that as well? Steve: Yeah like the preview. Laura: I think there’s some weird technology thing without actually– I don’t know. I can be wrong about that. Steve: Okay. That’s just interesting that you said that, because I remember when you told me about analytics, I was saying to myself, “Yeah, I guess” I was like “Bitly is probably good enough for me,” is what I was thinking at the time. Okay, that’s hilarious. That’s really interesting to know. So going forward then, what is your next strategy to kind of expand this, like you are probably well beyond the testing and validation stage. You got a bunch of customers at this point, what’s the grand plan with Meet Edgar. Laura: So the grand plan is just to keep improving the tool based on that core promise. So with any tool, just like – we are talking about with an ecommerce site – there’s a lot of stuff that you could add. So with the social media tool as some people are interested in a tool that monitors your brand on social media, or a tool that does customer service via social media. We would most likely not add those things to Edgar. Those are other social media tools. You can use a different tool that you got. We are a really content marketing focused social media tool. So our road map just looks at ways of making Edgar smarter. When should you be sharing different types of content? Which is your most effective content? Which is your least effective content? How can we be a little smarter in how we are sharing content from your blog? That’s a really interesting one to me. You know, you want to share new posts in a different frequency, or if you want to share old posts. So our roadmap is focused around improving your content marketing on social media. Steve: Okay. Are you guys going to be doing like AB testing of post headlines also? Laura: Yeah, that’s something that’s possible. It’s not in the roadmap right now, but I think that would be aligned with this core theme of improving the content itself on social. Steve: Okay, I was just curious because that’s like the first things that popped into my head actually when you were talking. Laura: Yeah, I knew that was going to come. Steve: Let’s see, what else did I want to cover here? Because I just think the whole SaaS model is just really cool, because once you have that customer base, the money just continues to flow in on a regular basis. Are you guys planning on doing– so Edgar is going to stand on its own, but at some point, once you have all those nice features in place, are you just going to leave that tool as is and then start something else or—? What I’m trying to ask is are you encapsulating all the futures in Edgar and then creating new tools to fulfill different needs for people, or are you just going to gradually expand the features of Edgar and make it a more encompassing tool? Does that make sense? Laura: Yeah, neither is the plan, but if we were going to do one, we’ll probably do other [inaudible] [0:40:26]. But I think it’s an interesting question, because I actually think that a big mistake a lot of entrepreneurs make is diversifying too much too soon. We have so much room to grow Edgar. Right now we have about 2,500 customers. Laura: That’s great. It’s so far from hitting every small business in America that uses social media marketing. We have hundreds of thousands of customers more just in the US that could sign up for Edgar. So I think a lot of tools make the mistake of, maybe they build an enterprise tool to go alongside of it. Maybe they go international. It’s a lot more boring to say, “No, we are just trying to reach every small business,” but that’s our strategy. Steve: Okay. Well it sounds good then. So Laura, I know we’ve been chatting for a while and if anyone wants to check out Edgar, or reach you if they have any questions, where can they find you? Laura: Yeah, so Edgar is at www.meeetedgar.com and that’s also our handle on Twitter and on Facebook and my Twitter handle is LKR. Steve: Awesome. Hey Laura, thanks a lot for coming on the show and thank you for introducing me to Edgar, because for me at least, and I’m like a walking testimonial here, it’s really done wonders for my social media platforms, because I don’t really have time for that stuff. And it’s just– the fact that it’s been able to automate everything has really saved me a lot of time. So thanks a lot for that. Laura: Awesome. You are welcome. Steve: All right Laura, take care. Steve: I hope you enjoyed that episode with Laura Rhoda. Prior to meetedgar.com managing all of my social media accounts was one big chore that I did not look forward to doing every single week. And Laura has created an awesome tool that I whole heartedly recommend you check out, because it has saved me a bunch of time. And I just to make it very clear that I am not affiliated with this tool at all. For more information about this episode go to www.mywifequitherjob.com/episode77, and if you enjoyed this episode, please got to iTunes and leave me a review. Because when you write me a review, it not only makes me feel proud, but it helps keep this podcast up in the ranks, so other people can use this information, find the show more easily and get awesome business advice from my guests. It’s also the best way to support the show. And please tell your friends because the greatest compliment that you can give me is to provide a referral to someone else either in person or to share it on the web. Now, as an added incentive, I’m always giving away free business consults to one lucky winner, every single month. For more information go to www.mywifequitherjob.com/contest. And if you’re interested in starting your own online business, be sure to sign up for my free six-day mini course where I show you how my wife and I managed to make over a 100K in profit in our first year of business. Go to www.mywifequitherjob.com for more information. Thanks for listening. Great podcast and thanks for introducing such a wonderful guest. Being in the SAAS business myself, I’m always looking for new and insightful ways of reaching more people and providing value to the customer. Since I’me currently in the process of completely overhauling my application at the moment, the barebones model of releasing quickly and often does resonate instead of trying to launch the perfect product from the get go. This is really unique. Social media automation. I am just thinking of teh time when people will generate maximum profits from social media and if teh process is automated what better can we ask for. Laura, you have a strange way of getting people to sign up. I just visited meetedgar and clicked on “Get Invitation”. All it does is getting my email address (? ).